Bill Clinton says he "loved" being president of the United States. Now he has teamed up with the world's bestselling novelist, James Patterson, to write a political thriller that draws on his time in the White House, called The President is Missing. "I love thrillers," says the former president. "I read huge numbers of them. I've just finished the third book in the Red Sparrow trilogy [by Jason Matthews]." He's "a fan" of Patterson's work too and has "devoured" all 25 of his books featuring the detective-turned-psychologist Alex Cross. "I didn't read much murder fiction or thrillers until the early 1980s and I just got into them," adds the man who was elected president in 1992 and served for two terms. Throughout that time, he had been harbouring a dream to write one himself. "I'd always wanted to do it," he explains. It is the first time a former US president has written a thriller. From the bowling alley in the basement of the White House to the treadmill in the president's bedroom, "we really tried to make it as accurate as possible", Clinton says. But as well as insider details, the book aims to show what it would be like to president in the most extreme circumstances. It may be a novel, but it is about "things that could happen". The plot revolves around a devastating cyber attack on the US, which threatens to bring the world to its knees. With the clock ticking, the president disappears. Being president can be "the most difficult job in the world", says one of the few men alive who knows. "What I want people to see is that this is real people doing real work. It matters. They make decisions. They affect your lives." And in what seems like a veiled criticism of the current president, Donald Trump, Clinton adds: "The more the election process becomes truncated into very short soundbites, and the more people respond to the theatre of it and the high or the low of it, the harder it is to remember sometimes it has to be a job." Political dramas like House of Cards and Scandal appear to show what life is like in the White House and in Washington's other corridors of power. And Bill Clinton tuned in to watch them along with millions of others. "I watched the first few seasons of House of Cards. The first one I thought was really, really good," he says. "I watched a lot of Scandal. A lot of the people involved in Scandal were friends and supporters. "But I thought to myself watching both of them, oh my God, a lot of people will believe this is normal, that people in the White House kill other people. Maybe even the president kills somebody. "Then they become immune to the fact that there are actually people who get up every day and do what they think is right." The President is Missing is itself being turned into a TV series after the cable giant Showtime acquired the rights to the novel. It it due to be broadcast next year. Bill Clinton thinks George Clooney would make a good president in the show, firstly because "he's been in this kind of situation before". Clinton points to Clooney's role as as an American Army Colonel tracking down stolen Russian nuclear weapons in 1997 film The Peacemaker. But there is another reason. "He looked great at the wedding" of Prince Harry and Meghan Markle at Windsor Castle last month, Clinton laughs. So that's the presidential vote for George Clooney. Bill Clinton left office in 2001. "Once in a while over the last 17 years there's been a particular problem come up and I felt that maybe I could have made a contribution," he says. Nonetheless, he tries not to look back. "I think it's a great mistake for anyone in life to spend any time worrying about something you can't do any more. I think you just have to go on." He is inspired by the basketball player Magic Johnson, who became an entrepreneur and philanthropist after he retired. "I admire Magic Johnson because no-one ever loved basketball more than he did, yet he's built a remarkable life since then." "I've been worried about this for a long time. It's something we're not doing enough to address. "Could the nuclear threat kill us all quicker? Yes. But we're on it. "I hope and pray that this effort with North Korea succeeds. Not because I think North Korea is about to drop a nuclear bomb, because that would be the end of their country. They know that. "The Dictators' Club just likes to have nuclear weapons because they think nobody will mess with them. "But this cyber threat could kill a lot more people in a lot less time just by shutting down things." He calls on people to consider what would happen if computer files and their backups were erased. "Medical records, every bank account, electrical systems" could all be destroyed, he insists. "To pretend this is not a problem - 'oh this is part of a political campaign' - is a great mistake." And he believes "we should have spent much more money" on "modernising" cybersecurity to counter the threat. "It's a lot cheaper dealing with this than building traditional hardware" like "battleships and planes", he says. 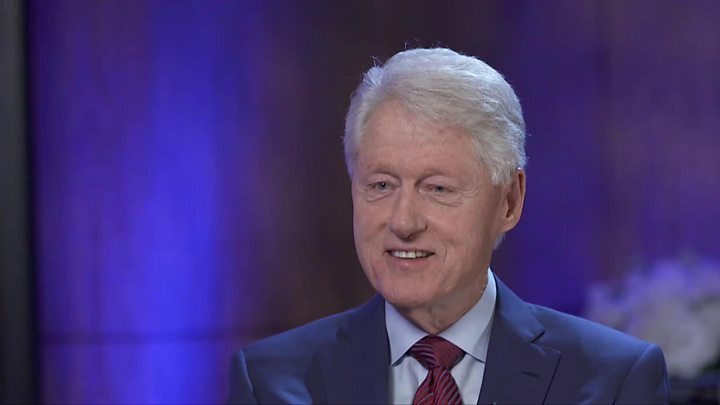 Bill Clinton says "we're yet to know" but "we ought to find out" if the outcome of the 2016 presidential election was influenced by alleged Russian interference. Donald Trump denies there was any collusion. In the mean time, to protect democracy from potential cyber hacks, the former president is calling for a return to pen and paper for the American electorate. "Until we get this straightened out, every state should go to some sort of paper ballot system," he urges. "At the computer hacking convention that is held every year in Las Vegas, the governor of Virginia sent his voting machine and his expert and it took him six minutes to hack it. "So they went to paper ballots and nobody complained about that election and they were counted just as quickly. "That should be done everywhere. Nobody should have to worry." Bill Clinton has written four books, including the bestselling memoir My Life. But The President is Missing is his first work of fiction. Will there be another one? "Maybe, let's see if people like this one. "There's an old saying that you can't teach an old dog new tricks. I'm an old dog and this is a new trick."